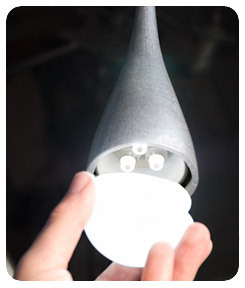 Custom Sustainable Lighting - Eleek Newsletter . May 2008 - Eleek Inc.
…and welcome to the eighth edition of Eleek Speak, our very occasional email newsletter. We hope this missive finds you all healthy and enjoying the promise of spring. Here in Portland, it’s been more like taunting actually but we just got several days of sunny weather to charge our batteries. Since we last wrote back in October, we have redesigned our website to be more intuitively user-friendly and informative. Please check it out and let us know what you think. We love your feedback! We have a new award of which we are very proud. Architectural Lighting magazine named Eleek in all four categories of its Architect’s Choice for Excellence (ACE) Awards in the November/December issue. We are especially proud of being named among the most innovative manufacturers. We have also taken some important steps to make our products even more sustainable. As of March of this year, Eleek now offers every luminaire it makes with one or more low-energy lamping option (which means that many of our luminaires are available with the choice of hard-wired LED or 4-pin compact fluorescent or the standard incandescent base). Eleek’s LED offerings are state of the art in terms of color, brightness and durability. For more information, see our new lamping comparison chart (PDF 120kb). Merging Eleek’s custom signage capabilities with award-winning luminaire design, Signalite offers functional retro styling with customizable logo design. 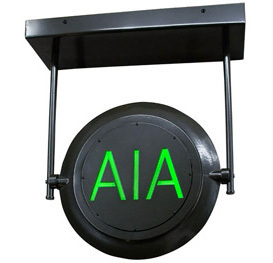 This LED-powered signage can be mounted from ceiling or wall, and comes in a variety of finishes. If you haven’t already seen this short video (http://www.thestoryofstuff.com), we can’t recommend it enough! It is the best explanation we have ever seen of how consumerism affects the environment, the economy and the political stability of the world. Thanks as always for your support of Eleek and your local, irreplaceable planet Earth. Kudos to Oregon voters who resoundingly voted the environment on Tuesday!